Hawick United Methodist Church - founded in 1904 - celebrated its centennial with weekend festivities. The church - with an adult membership around 50 - hosted a sing-a-long on Saturday night, a Sunday worship service, a lunch, and a centennial service on Sunday afternoon. Attendance on Sunday topped 150 people. Mel Jones emceed the centennial service at Hawick United Methodist Church on Sunday afternoon. The church was founded in 1904. Hawick was founded when the Great Northern Railroad passed through the area in the late 1880s. While much of Roseville Township was settled by German Catholics and Scandinavian Lutherans, the Hawick area also included many "old-time Americans" from Illinois, Iowa, Maine, New York, and Wisconsin, according to the church history, "Fifty Years of Service to Christ and Community 1904-1954: The Hawick United Methodist Church." Settlers - both Methodist and Presbyterian - worshipped together at a schoolhouse on Long Lake near Hawick. The Presbyterian members joined with a church in New London, while the Methodists shared ministers from Paynesville. In 1904, bolstered by some new Methodist families from Iowa, the Hawick Methodists started talking about building a new church, having outgrown the schoolhouse. Soon a lot was purchased, and a church was built in Hawick in 1904. 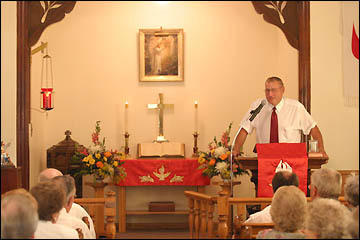 Hawick United Methodist has added to its church on several occassions, most recently in 1983 when the narthex was built. At the centennial service, former pastors and congregation members shared reflections about the church and its history, focusing on its friendly, family atmosphere, its caring parishioners, and its devotion to the Christian principles. Mike Laidlaw, who now runs a street ministry based in St. Cloud, showed some artwork he made in Sunday School at Hawick United Methodist Church. He credited the church with giving hime a great foundation for his ministry. The artwork now sits on his desk. "They spread the word, they practiced the word, and they cared about people," Osborne added about the congregation at Hawick United Methodist Church. After quoting the Book of Psalms about devotion to God, district superintendent David Bard told the congregation: "This church has been steadfast itself in its love of Christ." Other speakers at the centennial included Rev. Lesley Drake (who served the parish from 1957-61 and recalled rushing from Paynesville to Hawick to Union Grove Township for services one hour apart on Sunday mornings); Rev. Dennis Glad (who served from 1999-2000); and two church members who were called to the ministry, Mike Laidlaw and Barb Jones. Laidlaw, who operates a street ministry based in St. Cloud, and Jones, a part-time paster in Raymond, both said that Hawick United Methodist Church had given them a great foundation for their ministry. And, Eileen Werner of Paynes-ville wrote a letter on behalf of her late husband, Rev. 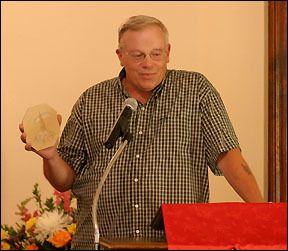 Earl Werner, who served as interim paster at Hawick United Methodist for several months. The atmosphere at Hawick United Methodist was, and always will be, as a family in Christ, wrote Werner.